Kairit Tammets, my first doctoral student will defend her thesis at 21st of August. Tammets, Kairit (2013) Learning and knowledge building practices for teachers’ professional development in an extended professional community. The purpose of her PhD research project is to investigate the process of the learning and knowledge building (LKB) in the extended professional community that is supported with the socio-technical system. Here is an advertisement to my lecture at MUP/PLE Lecture series podcast, at Open University of London. The podcast will be soon available. Mash-UP Personal Learning Environments (MUP/PLE) group on TELeurope: http://www.teleurope.eu/pg/groups/681/mupple/. From last five years, many master courses in Tallinn University, Institute of Informatics have been held as open learning courses using social software. Based on this experience with different learning design experiments, I have generalized the meta-design principles for open learning ecosystems. My main message is how to overcome the need for the teacher control in self-regulative learning ecosystems by using meta-design principles. I will start from the analysis of the characteristics of open learning ecosystems, and bring some examples of course designs that follow these characteristics. As the baseline for the design of the courses in open learning ecosystems I have used the eco-cognitive view of learning. This is based on the ecological psychology foundations defined by Gibson (1977) that focus on the emergent relationships of people with the environment using the affordance concept. For explaining which affordances each learner perceives and uses when he participates at the open learning courses with his personal learning environment, the activity theory framework developed by Yrjö Engeström (1987) appears useful. Some central ideas of my approach are borrowed from behavioural ecology, which studies the fitness of individuals to the niches of their species. An eco-cognitive approach explains cognition through distributed representations that are partially offloaded to the ecosystem. I will conceptualize the learning niches and explain how to use them in learning design. Next, I will introduce some meta-design approaches that involve the end-users to the development of evolving learning designs. I will explain how the meta-design approach may be used for the course design in open learning ecosystems. 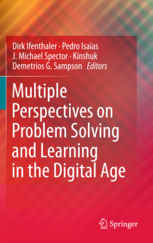 Finally, I will point to some innovative tools that we have used in our open learning master courses, and highlight some existing software limitations for the accumulation and adaptive use of learning niches in meta-design approach. An open learning ecosystem is a digital (but also a hybrid) learning environment where learners and teachers use personalized social software configurations to organize their learning. Open learning courses are open to new learners. The learning contents, as well as, the teaching ideas, the design methodologies and infrastructures are jointly developed and openly shared among this community. This brings variability of tools and approaches to the courses, making the learning environments complex and dynamically changing while learners try to adapt themselves to the course ecosystem. We use the ecosystem concept, because it allows us to apply the principles of ecology in digital learning environments. If we want to apply the ecology principles in digital systems, we need to find the match between the ecology concepts and the components of digital ecosystems. Ecology as a discipline deals with different levels of structural elements of ecosystems, both biotic and abiotic. For example, behavioural ecology focuses on the individuals of the species and their fitness to the niche of their species. Etology studies the interrelations of individuals. In digital ecosystems we have self-directed individual learners who create personal learning networks with other individuals, using social software, people and artifacts. In order to coexist, they need to monitor each other, navigate across their learning environments, and try to adapt themselves to the other individuals’ useful activity preferences within the shared learning niche. Population ecology studies the variability, the abundance and the distribution of individuals within one species, and how the species adapt to their niches, create and modify these niches. In digital ecosystems we have people with similar ideas, software preferences and behaviours for learning, who may be identified as one community or “species”. They contribute to their learning niche by co-designing and sharing learning contents, and by developing new learning behaviours. The community ecology focuses on the coexisting communities of species, their composition, interactions, organization and succession, as well as, on the food networks among species. In digital systems we can find similar self-regulative connectivist networks, and communities that co-exist in the same distributed software ecosystems, but using different, partially overlapping niches of it. This makes borrowing and transforming the ideas across community borders possible and creates the learning power in digital ecosystems. The most important assumption about open learning ecosystems is that the individuals’ self-directed learning behavour, personal learning environment creation, and open publishing causes the ecosystems to be open, dynamic and evolving. At the ecosystem level the accumulation of contents, useful learning behaviours, and ideas causes the changes in the ecosystem and in the community identities, that serves as an evolutionary feedback loop that impacts on individual learners’ perceptions of their learning ecosystem. Two pedagogical paradigms have been highlighted in open learning ecosystems. Firstly, the Interpretivist learning principles suggest that students should be guided towards becoming independent, autonomous and self-directed learners. Their learning must rise from their own interests and situations meaningful for them. It is important that they are not isolated but interact with other learners, acting also as teachers to the others. The learning contents, and software usage behaviours are not created in advance but are emerging and co-created as network-like structures. Every learner can contribute with its prior knowledge and experiences to the creation of open ecosystem knowledge, everyone has the voice and ability to influence the ecosystem. This guarantees the self-regulative and evolving nature of open learning ecosystems. One example of such course design was done in the European 6th framework project iCamp for the course eLearning. The learners and teachers from different European universities created the mixed learning teams, to learn about open learning designs and create the course prototypes and associated learning resources about their design solutions. The course backbone was run in the Moodle environment, from where the suggested learning resources and weekly activities could be found. However, all learners and teachers entered to the course with different sets of personal tools, which were to be connected into the open learning system for conducting individual and joint activities. The changes and evolvements of the course ecosystem appeared in different teams. The biggest challenge was to design and coordinate the course as an evolving open learning ecosystem. Another pedagogical paradigm in open learning ecosystems is Connectivism formulated by George Siemens. This approach cultivates the ecosystem view of digital systems. I define open and hybrid digital ecosystems based on Boley and Chang (2007). It is an open, self-organizing environment binding geographical and web based locations, individuals, social software based information services, network interaction and knowledge sharing tools along with resources that help maintain synergy among people, where each subject is proactive and responsive regarding its own benefit/profit. One example master course, “Ecology of narratives” that used the Connectivism ideas was run in Tallinn University (Pata & Fuksas, 2009). The learning design approach was built on the idea of initiating the emergent narrative collaboration using only the self-regulated storytelling activities. The main element of this design was to provide learners with some design rules, such as determining shared tags, and restricting the behavioural rules from traditional pre-decided group collaboration to emergent co-construction in networks. 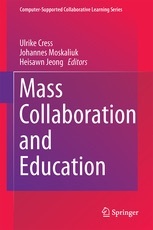 The co-construction emerged due to highly connected networks created among course participants who were using friend-feeds, place-feeds and mashed tag-feeds in various interconnected social software environments. These two examples highlight the main problem in the learning design for open learning ecosystems. We need the learning design approaches that enable teachers to regain some co-control in the learner-initiated activities and in the appearing open ecosystems for learning. In one hand we do want learners to be self-directed in creating learning goals, developing learning activities with personal tools, and choosing and constructing learning contents. We wish to promote the bottom-up emergence of the learning ecosystems. On the other hand, we need to coordinate our courses to some extent at the universities, if we want to use the distributed learning environments. The theoretical background for designing open learning ecosystems comes from ecological psychology. It is assumed that for interacting with the environment, we need some cognitive anchors. Humans constantly delegate cognitive functions to the environment. We may leave these anchors by ourselves, anchors may be left by other people who interacted with these surroundings before, these may be for example culturally defined. By doing so we constrain the action potentialities of the environment and help to focus on certain action- or emotion possibilities. But it must be admitted, that such cognitive functions are not stabile design elements in the environment – we cannot assume that everyone would perceive these affordances, or that they would afford the same actions and emotions. Bardone (2011) emphasizes this ambivalence in developing these cognitive functions. He writes that human cognition is chance-seeking system that is developed within an evolutionary framework based on the notion of cognitive niche construction. We build and manipulate cognitive niches to create additional resources for behavior control. These cognitive niches are determined by affordances. Cognitive niches are distributed between internal mental spaces and external spaces in the environment. Behavioural/emotional constraints and afforded action/emotion potentialities may appear due to previous action/emotion experiences of the learner in this or in similar environment. Learners’ actual goals may highlight and actualize some affordances. Some affordances may be embedded/highlighted by teacher through instructions or may appear due to the presence of other learners’ activities. Each learner has a different cognitive niche in certain activity, and it may change in the course of action. This causes high variability of affordances that may be actualized in open learning ecosystem for same learning goals. Another standing-point to identify, which affordances might be actualized in a personal learning environment, is using the activity system approach (Engeström, 1987). PLE is distributed ecologically, integrating our minds with the environment. We may assume that at each moment a different configuration of the activity system is active. To reach our learning goals we need to actualize different mediators, such as cognitive concepts, details from artifacts, software, or rely on some community activities. Rules and distribution of labor, common to the certain community, as well as, their personal learning environments, ideas, and the joint ecosystem structural elements may afford different mediators to be available for achieving certain actions or emotions. Affordances in our cognitive niche form a networked system. They may constrain or actualize each other. Synergy may be arrived from using several affordances simultaneously. Some affordances may need the presence or the co-activation of other affordances to be used effectively. An interesting aspect from the learning design perspective is that some of the affordances are offloaded to the ecosystem. While any individual conceptualizes affordances personally, in a community such perceived and offloaded affordances may accumulate, forming the community’s learning niche. This niche conceptualization is closer to the niche concept in biology. Hutchinson (1957) defined a niche as a region (n-dimensional hypervolume) in a multi-dimensional space of environmental factors that affect the welfare of a species. Niches have been conceptualized as the environmental gradients with certain ecological amplitude, where the ecological optimum marks the gradient peaks where the organisms are most abundant. So, niche is not the environment itself, the habitat, but what it affords. For example the range of temperature, the length of daylight, the abundance of certain food form the dimensions for a niche for certain species. In digital systems these dimensions may associate with the properties of certain activity systems: for example complexity of assembling, accumulating, pulling content; degree of reputation, privacy, security, surveillance, interaction, co-construction in the community etc. In one of my open learning ecosystem courses (Pata, 2009) we asked students to associate self-defined affordances with social software. We grouped these affordances under some activity types. As a result we could find what types of affordances were more commonly perceived by everyone, and which appeared to be rare. 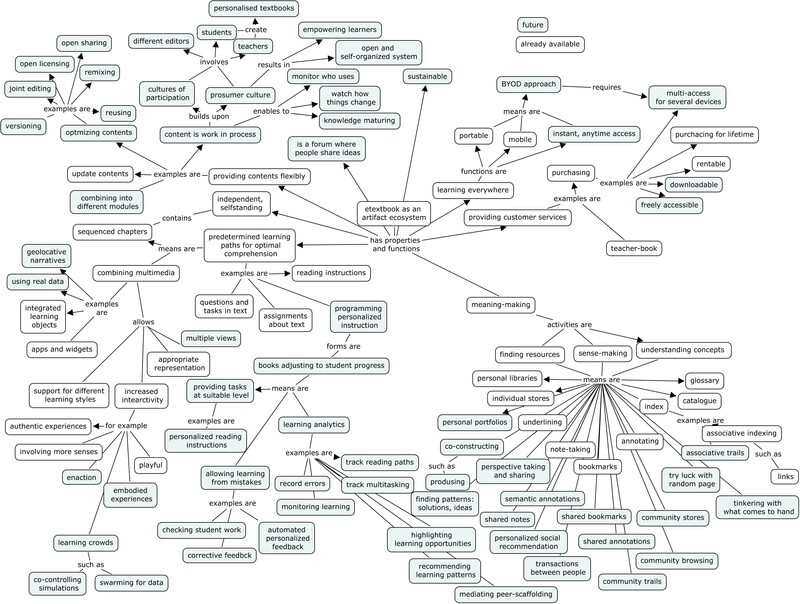 To make a visualization of the community’s learning niche we plotted the niche as the map of affordance “mountains”. However, this visualization is also a bit misleading – the real niche should be plotted into an abstract multidimensional space. This visualization does not consider the affordances that appear due to the presence of other affordances. For example, some software functionalities (tagging) may make available other affordances only if a community uses them actively (browsing the community members’ resources). We also found in this study, that at different years the community niche of social software affordances appeared similar. On the other hand, for individual and collaborative assignments the niche dimensions were significantly different. So I propose that the accumulated community niches for different learning goals may indicate the effective affordances for certain communities. The community’s affordances may be interpreted and used by each learner to best adapt to the community niche for certain goal-based action. Adaptation is the adjustment of an organism to its environment in the process by which it enhances fitness to its niche. Such interplay in which each individual contributes to the formation of his cognitive niche, but also to the accumulation of the community’s niche, and simultaneously adjusts his affordance perception to his community niche is the central idea in dynamic evolving learning ecosystems. It is one of the key points in meta-design framework as well. There have been some attempts to use the affordance concept in the learning design principles. This model from Kirchner and associates (2004) determines learners’ perceived affordances from their behaviour in the learning system, develops supportive and constraining affordances for interacting with the system and monitors the effectiveness of such affordance-based cognitive tools. However, learner’s role in this design approach is passive, the design is created by the teacher. Also, the dynamic evolvement of the learning environment is not expected. So, this model has limitations from the open learning ecosystem design perspective. Another design approach, that considers adaptive and dynamic nature of the ecosystems is a meta-design framework proposed by Gerhard Fisher (2004) and associates. Meta-design is designing the design process for cultures of participation – creating technical and social conditions for broad participation in design activities. The meta-design approach is directed to the formation and evolution of open learning ecosystems through the end-user design. The meta-design approach is known as a methodology for collaborative co-design of social, technical and economic infrastructures in interdisciplinary teams in order to achieve synergy similarly to the symbiosis phenomena in natural environments. The meta-design, known from End User Design in computer science, extends the traditional notion of system development to include users in an ongoing process as co-designers, not only at design time but throughout the entire existence of the system. Autonomous and self-organized designers in meta-design framework can increase the diversity of design solutions in the system, allowing diversity and variability to emerge within the ecosystem. Hagen & Robertson visualize in their paper some meta-design models as open, community-driven, emergent and iterative activity sequences that are based on user contribution. Figure 1. The design solution is iterated through the participation in use. For example the e-learning course may be run at different years, the affordances may be collected post-activity, as in Kirchner’s model, and the revisions of the course ecosystem could be made. If letting the accumulated contents and affordances inside the system, the next round of the course may be able to navigate in the ecosystem better than the first participants. Figure 2. The design emerges into different directions through participation. Such designs in open learning communities may be validated by individuals, and the best, most actively used solutions will become temporally stabile as community niches. This type of design is common in swarming activities. Figure 3. The initial design may be outsourced to the users, and appears as an assembled collage. This approach is more common in open content creation, for example in wikis. Figure 4.The design may also be opened to the community participation throughout design, that may gradually shift the perceived niche of affordances. Such design is most common in the stabile open learning communities – some affordances will be discovered, others will be forgotten in time. Similarly to behavioural ecology principles, in meta-design we can see the interplay between self-directed individual designers (in our case learners), and the niche (the affordances of the design solution) that appears as the result of their activities. Learning in the cultures of participation may be characterized as the process in which learner and the system (community, culture) detects and corrects errors in order to fit and be responsive. In this definition, learning and designing process is conceptualized as largely self-organized, adaptive and dynamic. It may be assumed that such learning and meta-design follows the ecological principles. Both focuses – the learning ecosystem evolution by end-user design, and nourishing the end-user design process by creating the scaffolds for designing, are equally important aspects of ecological Meta-Design. Such scaffolds may be the visualizations of the emergent community’s learning niche. Learners should be facilitated to be self-directed. For this they are required to keep personal conversational learning contracts throughout the learning process. For example they could map their goals, and how they will achieve these goals, what affordances appeared useful in action. Learners need to dynamically integrate their personal learning environments with the other learner’s environments, in order to perform some joint tasks or allow better awareness of each other’s activities. The affordances perceived during the course may change depending of their goals. In order to better adapt to the digital ecosystem, the learners would need meta-level guidance. For example, the rules and conditions (shared tags etc.) that facilitate niche accumulation may be determined by the teacher. The nature of activities may be selected such that supports self-regulation-based collaboration (for example swarming activities). The learners and the teacher should be able to monitor the state of the niche, and can adjust their learning behaviours to the niche. So, what would the learners do? In learning ecosystems autonomous learners continuously develop and dynamically change design solutions to support their learning. 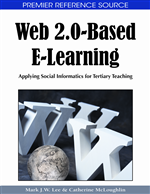 They incorporate into their personal learning environments different Web 2.0 tools, networking partners and artifacts, and monitor the state of the whole learning ecosystem to adapt their design solutions and learning objectives to the system and to other learners. •Bardone, E. (2011). Seeking Chances. From Biased Rationality to Distributed Cognition. Springer, Heidelberg. •Boley, H., & Chang, E. (2007). Digital Ecosystems: Principles and Semantics, published at the 2007 Inaugural IEEE International Conference on Digital Ecosystems and Technologies. Cairns, Australia. February 2007. NRC 48813. •Crabtree, A., & Rodden, T. (2007). Hybrid ecologies: understanding interaction in emerging digital-physical environments. Personal and Ubiquitous Computing, Online First: DOI 10.1007/s00779-007-0142-7. •Fiedler, S,; Pata, K. (2009). Distributed learning environments and social software: in search for a framework of design. In Stylianos Hatzipanagos and Steven Warburton (Eds.). 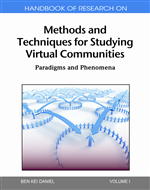 Handbook of Research on Social Software and Developing Community Ontologies. (145 – 158). Idea Group Reference. •Engeström, Y. (1987). Learning by Expanding: An Activity-Theoretical Approach to Developmental Research (http://communication.ucsd.edu/MCA/Paper/Engestrom/expanding/toc.htm). •Fischer, G., Giaccardi, E. Ye,Y., Sutcliffe,A.G., Mehandjiev, N. (2004). META-DESIGN: A MANIFESTO FOR END-USER DEVELOPMENT. COMMUNICATIONS OF THE ACM September 2004/Vol. 47, No. 9 (33-37 . •Gibson, J.J. (1977). The theory of affordances. In R. Shaw & J. Bransford (eds. ), Perceiving, Acting and Knowing. Hillsdale, NJ: Erlbaum. •Kirschner, P., Strijbos, J. W., Kreijns, K., Beers, P. J. (2004). Designing electronic collaborative learning environments. Educational Technology Research and Development 52(3), 47–66. •Pata, K. (2009). Modeling spaces for self-directed learning at university courses. Educational Technology & Society, 12 (3), 23–43. •Pata, K., Fuksas, A. P. (2009). Ecology of Embodied Narratives in the Age of Locative Media and Social Networks: a Design Experiment. Cognitive Philology, 2, 1 – 21. •Pór, G., & Molloy, J. (2000). Nurturing Systemic Wisdom Through Knowledge Ecology. Systems Thinker, 1 (8), 1–5. •Põldoja, H., Laanpere, M. (2009). Conceptual Design of EduFeedr – an Educationally Enhanced Mash-up Tool for Agora Courses. In: Mashup Personal Learning Environments: MuPPLE 09, Nizza, 29.September 2009. (Eds.) Fridolin Wild, Marco Kalz, Matthias Palmér, Daniel Müller. Aachen (online):, 2009, (CEUR Workshop Proceedings; 506). •Zhang, J. & Patel, V.L. (2006). Distributed cognition, representation, and affordance. Distributed Cognition: Special issue of Pragmatics & Cognition 14, 333-341. In this paper we will introduce the ecological Meta-Design framework for open learning ecosystems. Meta-design is designing the design process for cultures of participation – creating technical and social conditions for broad participation in design activities (Fisher et al., 2004). Such cultures of participation represent the new types of learners in open learning ecosystems. They are self-directed, largely autonomous, and take design initiatives in respect of their learning environments (Fiedler & Pata, 2009; Pata, 2009; Väljataga & Laanpere, 2010). Learning in the cultures of participation may be characterized as the process in which learner and the system (community, culture) detects and corrects errors in order to fit and be responsive. In this definition, learning process is conceptualized as largely self-organized, adaptive and dynamic. We assume that such learning follows the ecological principles, which have been effectively used to explain processes and systems in technology enhanced learning (Pór & Molloy, 2000; Crabtree & Rodden, 2007; Vyas & Dix, 2007; Boley & Chang, 2007; Vuorikari & Koper, 2009; Pata, 2009). Open learning ecosystem is an adaptive complex and dynamic learning system in which self-directed learners design their learning activities and follow open education principles by sharing freely over the internet knowledge, ideas, infrastructure and teaching methodology using Web 2.0 software. Without wishing to suppress down such a bottom-up self-emergence of eLearning designs, providing teachers in learning institutions with design solutions that enable them to regain some co-control in the learner-initiated activities and systems is needed. In this paper we aim to describe how ecology principles form the baseline for Meta-Design of learning in open learning ecosystems. Such Meta-design principles are needed to provide teachers in open learning environments with new models for organizing learning courses that consider the design activities of the cultures of participation. In this paper we propose that the ecological Meta-Design framework applies for open learning ecosystems that are adaptive and dynamically changing. Both focuses – the learning ecosystem evolution by end-user design, and nourishing the end-user design process by creating the scaffolds for designing (see Ehn, 2008; Fisher et al., 2004), are equally important aspects of ecological Meta-Design. In learning ecosystems autonomous learners continuously develop and dynamically change design solutions to support their learning. They incorporate into their personal learning environments different Web 2.0 tools, networking partners and artifacts, and monitor the state of the whole learning ecosystem to adapt their design solutions and learning objectives to the system and to other learners. d) seed learning activities into the open learning ecosystem that are based on self-organization (e.g. swarming). We will provide an insight to the learning design models in which ecological principles have been used. Such learning designs provide us with different views for modeling the ecological Meta-Design process, and highlight important components of our framework. d) The eco-cognitive learning design models, which explain differentiated and contextually conditioned perception of learning affordances, that results in learning system evolvement by learner contribution and adaptation (Pata, 2009). From 2008-2013 our team in Tallinn University, Center for Educational Technology was fulfilling the grant “Distributed learning environments, their interoperability, and models of application”. We developed the framework and tool prototypes for supporting self-directed learning in augmented learning environment. An augmented learning environment is defined as such merging traditional learning environment and a virtual learning environment together with various technological tools and social software. I. A model of self-directed learning where learners are involved in development of their personal learning environment was created. Mainly bachelor and master level students were involved in performing the empirical studies. A conceptual framework for designing learning courses which focus on the development of competences of self-directed learners is developed. c)	the course Narrative ecology in TLU. The students’ visually- and verbally-presented self-reflected feedback to the learning environments and activity patterns was collected from the augmented environments. d)The new swarming behaviors of creating personal and collaborative narratives in augmented environment as the self-generative phenomenon, and the changes in the storytelling standards were identified and explained using the ontospace approach (Pata, 2009; 2010;2011). These empirical results provided an input to determining the characteristics of learning design framework for self-directed learning in augmented learning environments (Fiedler & Pata, 2009; Pata, 2009a,b; Pata, 2010a,b; Pata & Merisalo, 2009; Pata & Merisalo, 2010; Pata, 2011; Normak, Pata, Kaipainen, submitted; Pata & Laanpere, submitted). The main characteristics of an ecological framework to learning design for self-directed learning in augmented learning environments adopt the ecosystems principles for describing pedagogical processes in learning space. The framework assumes the following: The nature of education is changing and the prioritization of learning experiences from informal and non-formal education, besides formal education, is expanding the range of learning options. Beyond the boundaries of formal higher education individuals have to structure and carry out their activities without a support of educational authorities. Therefore, in parallel to teaching domain related knowledge, formal higher education should create opportunities for students to practice and advance their dispositions for self-directing intentional learning projects. Giving students increased control over crucial instructional functions may be achieved by promoting self-directed individuals, who are capable of updating their knowledge and skills outside of formal educational systems. Therefore, instructional design should rather be seen as an intervention design of challenging situations with placement of constraints. An emerging personal learning environment (PLE) approach to augmenting learning environments emphasizes learner control over an environment and networking. An elaborated understanding of PLE integrates important instructional functions of learner control as an expression of self-direction and gives an opportunity to talk about self-directing intentional projects, in which an individual is provided with much higher control over his project and environment. Setting up one’s PLE in relation to a particular learning project has two sides: it requires a certain degree of learner control and on the other hand it also helps to practice dispositions. 2) For achieving maximal results individually, there is a need to discover how learners with similar goals belonging to the appropriate learning community would conduct their learning, and orientate one’s activities accordingly. 1. Define the learning and teaching niches for your students by collecting their affordance perceptions of their learning spaces dynamically in the course of action. 2. To support the conscious self-managed development of learner-determined spaces, provide students with the tools of visualizing and monitoring their activity-patterns and learning landscapes, and enhancing public self-reflection and collaborative grounding of learning affordances. 3. To maintain coherence of the current niche, introduce cycles of re-evaluation of learning affordances of the learning space within your course. 4. Try to influence the niche re-emergence by embedding activity traces and ecological knowledge relevant to evoke affordances for certain niches or select activity systems where these traces are naturally present. 5. Use same social learning environments repeatedly to gain from feedback left as activity traces and embodied knowledge of earlier learners. Paper The Ecological Meta-Design framework for Web 2.0 Learning Ecosystems by Pata & Laanpere is in progress. In this paper we summarize the learning patterns of self-directed learners in different augmented settings and propose the design framework. Tammets, Kairit; Väljataga, Terje; Pata, Kai (2008). Self-directing at social spaces: conceptual framework for course design . Ed-Media, Viin, 30. juuni-4. juuli, 2008. AACE, 2008, 2030 – 2038. Pata, K. (2009). Modeling spaces for self-directed learning at university courses. Journal of Educational Technology & Society, 12, 23 – 43. Väljataga, Terje (2009). Selecting tools and services:an expression of self-direction in higher education. In: The Proceedings of the 8th European Conference on e-Learning: 8th European Conference on e-Learning, Bari, Italy, 29-30. Oct. 2009. (Toim.) Dan Remenyi. UK: Academic Publishers, 2009, 665 – 671. Väljataga, Terje (2009). If a student takes control: facilitator’s tasks and responsibilities. In: Advances in Web Based Learning – ICWL 2009: 8th International Conference, Aachen, Germany, August 2009. (Toim.) Marc Spaniol, Quing Li, Ralf Klamma, Rynson W.H. Lau. Germany: Springer Heidelberg, 2009, (LNCS 5686), 390 – 399. II. An ecological approach to learning dynamics was developed that bases on the idea of dynamically evolving learning space that is described by certain ontological coordinates and terms borrowed from physical ecosystems. In the ecological framework of learning design model we have described in detail using the spatio-dynamic ontospatial methods, how individual learners would determine their learning paths in the community learning space. a) Learners’ perception to their individual and collaborative learning niches with social software using affordances was described (Pata, 2009a,b; Väljataga, Pata, Tammets, 2010) and formalized using dynamic ontospatial methods (Normak, Pata & Kaipainen, submitted). b) Learners’ individual and collaborative perspectives within the shared ontospace in hybrid ecosystem were characterized (Pata, 2010). We assume that new approaches to emergent learner-directed learning design can be strengthened with a theoretical framework that considers learning as a dynamic process. We propose an approach that models a learning process using a set of spatial concepts: learning space, niche, perspective, state of a learner, step, path, direction of a step and step gradient. A learning process is presented as a path within a niche (or between niches) in a learning space, which consists of a certain number of steps leading the learner from the initial state to a target state in the dynamically changing learning space. When deciding on steps, the learner can take guidance from learning paths that are effective from a viewpoint of the learning community. Kaipainen, M.; Normak, P.; Niglas, K.; Kippar, J.; Laanpere, M. (2008). Soft ontologies, spatial representations and multi-perspective explorability. Expert Systems, 25(5), 474 – 483. Pata, K.; Fuksas, A.P. (2009). Ecology of Embodied Narratives in the Age of Locative Media and Social Networks: a Design Experiment. Cognitive Philology, 2, 1 – 21. Pata, K. (2010). An ontospatial representation of writing narratives in hybrid ecosystem. In: Proceedings: Workshop on Database and Expert Systems Applications: 21st International Workshop of DEXA, 3rd International Workshop on Social and Personal Computing for Web-Supported Learning Communities. August, 30th – September, 3rd 2010, Bilbao, Spain.. (Toim.) A.M.Tjoa and R.R.Wagner. Los Alamitos, California: IEEE Computer Society Press, 2010, 87 – 91. Normak, P., Pata, K. & Kaipainen, M. (submitted). An Ecological Approach to Learning Dynamics. Tomberg, Vladimir; Laanpere, Mart (2009). RDFa versus Microformats: Exploring the Potential for Semantic Interoperability of Mash-up Personal Learning Environments. In: Mashup Personal Learning Environments: MUPPLE 09, Nizza, 29.September 2009. (Toim.) Fridolin Wild, Marco Kalz, Matthias Palmér, Daniel Müller . Aachen:, 2009, (CEUR Workshop Proceedings; 506). Põldoja, Hans (2010). EduFeedr: following and supporting learners in open blog-based courses. In: Open ED 2010 Proceedings: Open Ed 2010 – The Seventh Annual Open Education Conference, Barcelona, 2.-4. november 2010. Barcelona: UOC, OU, BYU, 2010, 399 – 407. Leinonen, Teemu; Purma, Jukka; Põldoja, Hans; Toikkanen, Tarmo (2010). Information Architecture and Design Solutions Scaffolding Authoring of Open Educational Resources. IEEE Transactions on Learning Technologies, 3(2), 116 – 128. Põldoja, Hans; Väljataga, Terje (2010). Externalization of a PLE: Conceptual Design of LeContract. In: The PLE Conference: The PLE Conference, Barcelona, 8.-9. juuli 2010. Barcelona:, 2010. I have been preparing the lecture for introduction of new media, and reading Manovich and Castells. In the end i visualized how the techno-social ecology might be represented for students. Actually, i will use it for explaining what is new media. I find that the explanation in wiki is not the most clear one. New media – a technology or culture? Examine critically new media definitions – can YOU define what is new media? Manovich (2008): We are largely ignorant of collaborators who have gradually turned computer into a cultural machine it is today. They knew that they were turning physical media into new media with additional properties to interact with. Is it a good definition or should it be broadened? The aim of the inventors of computational media was not to simply create accurate simulations of physical media but in every case the goal was to create “a new medium with new properties” which would allow people to communicate, learn, and create in new ways (Manovich, 2008). Which ideas from the past have influenced new media development significantly? Turn computers into a “personal dynamic media” which can be used for learning, discovery, and artistic creation. New media are expandable – Users themselves should be able to easily add new properties, as well as to invent new media. These new media use already existing representational formats as their building blocks, while adding many new previously nonexistent properties. By developing easy to use GUI-based software to create and edit familiar media types software turned a digital computer into a “remediation machine”. Manovich (2008): the pioneers of computational media did not have the goal of making the computer into a “remediation machine” which would simply represent older media in new ways. Instead, knowing well new capabilities provided by digital computers, they set out to create fundamentally new kinds of media for expression and communication. Vannever Bush had the idea of a massive branching structure, a memex – as a better way to organize data and to represent human experience. The human mind operates by association. Selection by association, rather than indexing, may yet be mechanized. Consider a future device for individual use, which is a sort of mechanized private file and library. A library of a million volumes could be compressed into one end of a desk. Memex affords to associative indexing, the basic idea of which is a provision whereby any item may be caused at will to select immediately and automatically another. This process of tying two items together is the essential feature of the memex. The user finds two items by association and connects them into a trail, and names it. When numerous items have been thus joined together to form a trail, they can be reviewed in turn. Occasionally a comment of his own may be inserted, either linking it into the main trail or joining it by a side trail to a particular item. Otlet imagined a day when users would access the database from great distances by means of an “electric telescope” connected through a telephone line, retrieving a facsimile image to be projected remotely on a flat screen. The book is questioning of the idea of history as a single path or linear process; posing instead the idea of history branching out in an infinite number of different directions at every point in time and space. Every space-time node is the center of a system of branching or forking paths, an ever-recurring moment/place of choice with profound effects on and links to everything else. In terms of cyberspace, potential hypertextual journeys and branches are possible at every underlined link, every particle event. Documents connected through hypertext (rather than using links to drift through the textual universe associatively and “horizontally,” we move “vertically” between more general and more detailed information). 1965 – in the article A File Structure for the Complex, the Changing, and the Indeterminate Nelson talks about new complex interconnectivity of texts and pictures without specifying any particular mechanisms that can be employed to achieve it. Let me introduce the word “hypertext” to mean a body of written or pictorial material interconnected in such a complex way that it could not be conveniently be presented or represented on paper (1965). ’Hypertext’- is not technology but potentially the fullest generalization of documents and literature (2007). The hyperfilm – a browsable or vari-sequenced movie – is only one of the possible hypermedia that require our attention. 1965 – “chunk style” hypertext – static links that allow the user to one-way jump from page to page. “The philosophical consequences of all this are very grave. Our concepts of ‘reading’, ‘writing’, and ‘book’ fall apart, and we are challenged to design ‘hyperfiles’ and write ‘hypertext’ that may have more teaching power than anything that could ever be printed on paper”. Manovich (2008): Nelson clearly dislikes “ordinary text” and his emphasis is on complexity and interconnectivity and on breaking up conventional units for organizing information such as a page. Sutherland’s PhD thesis: Sketchpad: A man-machine graphical communication system. In the post-information age, we often have an audience the size of one and information is extremely personalized. In being digital I am me.. Me includes information and events…But that unique information about me determines news services I might want to receive. True personalization is now upon us. The next decade will see cases of intellectual-property abuse and invasion of our privacy. Think of hypermedia as a collection of elastic messages that can stretch and shrink in accordance with the reader’s actions. Being digital has four very powerful qualities that will result in its ultimate triumph: decentralizing, globalizing, harmonizing, and empowering. Lev Manovich, The Language of New Media The MIT Press, 2001. New media may look like media, but this is only the surface. Wrong trend to treat the cultural products of computer (word processing documents, cinema with digital special effects, hypertext) as nothing more than old media enhanced by the flexibility and transportability of digital code and a global network. The computer suggests the relative autonomy of computable information from its media “surface – computer running software produces digital code which simply is not a medium. His topology of new media is based on a self-conscious analogy to the conventional “levels” of the computer hardware and software (from microprocessor through operating system to high level application). Second, new media objects have modularity at the level of representation and at the level of code. Thus, new media objects are composed from an assemblage of elements that sustain their separate identity, and can be operated upon separately, without rendering the rest of the assemblage unusable. Modular programming speeds the development and maintenance of large-scale software. Fourthly, while old media depended upon an original construction of an object that could then be exactly reproduced (for example as printed book or photograph), new media is characterized by variability. The variability of new media allows for branching-type interactivity, periodic updates, and scalability as to size or detail. Fifth, new media finds itself at the center of the “transcoding” between the layers of the computer and the layers of culture. “Cultural interfaces”, not just the diverse software interfaces of new media but also the formal traits and user practices with the printed word and cinema, can migrate into, and become part of, the interfaces of new media. From media studies, we move to something which can be called software studies; from media theory — to software theory. In the end of the 20th century humans have added a fundamentally new dimension to their culture. This dimension is software in general, and application software for creating and accessing content in particular. “Adding” software to culture changes the identity of everything which a culture is made from. Software: Search engines, recommendation systems, mapping applications, blog tools, auction tools, instant messaging clients, and platforms which allow others to write new software – Facebook, Windows, Unix, Android – are in the center of the global economy, culture, social life, and, increasingly, politics. Software (with the exception of Open Source movement) is still invisible to most academics, artists, and cultural professionals interested in IT and its cultural and social effects. If we don’t address software itself, we are in danger of always dealing only with its effects rather than the causes: the output that appears on a computer screen rather than the programs and social cultures that produce these outputs. Definition: “Cultural software” means software programs which are used to create and access media objects and environments. “Cultural software” is software directly used by hundreds of millions of people and that it carries “atoms” of culture (media and information, as well as human interactions around these media and information). Applications for media development (or “content creation”) – It is a subset of application software which enables creation, publishing, accessing, sharing, and remixing images, moving image sequences, 3D designs, texts, maps, interactive elements, as well as various combinations of these elements such as web sites, 2D designs, motion graphics, video games, commercial and artistic interactive installations, etc. The tools for social communication and sharing of media, information, and knowledge such as web browsers, email clients, instant messaging clients, wikis, social bookmarking, social citation tools, virtual worlds, and so on – in short, “social software”. The programming environments also can be considered under cultural software. The media interfaces themselves – icons, folders, sounds, animations, and user interactions – are also cultural software, since these interface mediate people’s interactions with media and other people. Information society, knowledge society, or network society dimensions are enabled by cultural software. The “knowledge workers”, the “symbol analysts”, the “creative industries”, and the “service industries” – all these key economic players of information society can’t exist without cultural software. Software is what also drives the process of globalization. Software Studies has to investigate both the role of software in forming contemporary culture, and cultural, social, and economic forces that are shaping development of software itself. If we are to focus on software itself, we need a new methodology. “Software” is a new object of study which should be put on the agenda of existing disciplines and which can be studied using already existing methods – for instance, object-network theory, social semiotics, or media archeology. How software is shaping our culture, and how it is shaped by culture in its turn? The most fundamental dimension of software-driven media experience is interactivity. The final media experience constructed by software can’t be reduced to any single document stored in some media- we are engaging not with pre-defined static documents but with the dynamic outputs of a realtime computation. When a user interacts with a software application that presents cultural content, this content often does not have definite finite boundaries. – the user’s experience is only partly defined by the file’s content. – the interfaces/tools provided to navigate and work with this media. The move from desktop applications to webware (applications running on the web), social media sites, easy-to-use blogging and media editing tools such as Blogger, iPhoto and iMovie and the addition of full media capabilities to mobile phones – have transformed how ordinary people use media. What gets remixed today is not only content from different media but also their fundamental techniques, working methods, and ways of representation and expression. Although we see a number of important new types of cultural modularity emerged in software era, it is important to remember that modularity is something that only applies to RSS, social bookmarking, or Web Services. We are talking about the larger cultural logic that extends beyond the Web and digital culture. What seems to be happening is that the “users” themselves have been gradually “modularizing” culture. In other words, modularity has been coming into mass culture from the outside, so to speak, rather than being built-in, as in industrial production. Manovich (2008): I believe that we are now living through a second stage in the evolution of a computer metamedium, which follows the first stage of its invention and implementation. This new stage is about media hybridization. In contrast, in the case of media hybrids, interfaces, techniques, and ultimately the most fundamental assumptions of different media forms and traditions are brought together resulting in new species of media. 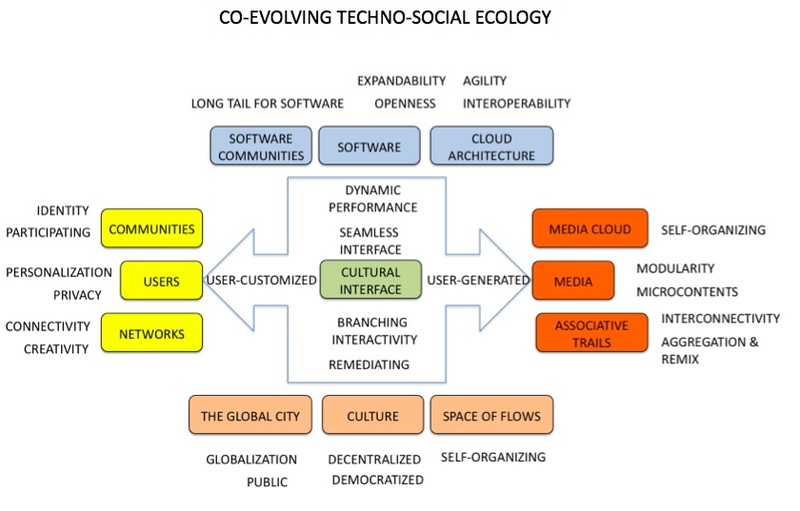 None of the software programs and web sites function in isolation but participate in larger techno-social ecology as a whole. The new paradigms that emerge in the 2000s are not about new types of media software per ce. Instead, they have to with the exponential expansion of the number of people who now use it – and the web as a new universal platform for non-professional media circulation. “Social software,” “social media,” “user-generated content,” “Web 2.0,” “read/write Web” are some of the terms that were coined in this decade to capture these developments. Richard MacManus and Joshua Porter (2005), “Enter Web 2.0, a vision of the Web in which information is broken up into “microcontent” units that can be distributed over dozens of domains. The Web of documents has morphed into a Web of data. A much large number of producers publish content into “a global media cloud”; the users create personalized mixes by choosing from this cloud. In the new communication model that has been emerging after 2000, information is becoming more atomized. You can access individual atoms of information without having to read/view the larger packages in which it is enclosed. Space is not a refection of the society, it is its expressions. Spatial forms and processes are formed by the dynamics of the overall social structure. Social processes influence space by acting on the built environment inherited from the previous social-spatial structures. The information age is ushering in a new urban form, the informational city. The new society is based upon knowledge, organized around networks, and largely made up of flows. The “space of flows” is the material organization of time-sharing social practices that work through flows. “the space of flows” . . . links up distant locales around shared functions and meanings on the basis of electronic circuits and fast transportation corridors, while isolating and subduing the logic of experience embodied in the “space of places”. In the network of interaction no place exists by itself, since the positions are defined by flows. Places do not disappear, but their logic and meaning becomes adsorbed in the network. The space of flow is not placeless – some places are exchangers, communication hubs; other places are nods of the network for strategically important functions. A place is a locale, people still live in places but function and power in societies are organized in the space of flows. The global city is not a place, it’s a process. A process by which centers of productions and consumptions of advanced services, and their ancillary local societies are connected in a global network, while simultaneously downplaying the linkages with their hitherlands, on the basis of information flows. “transmission” view of culture describes mass communication (and sometimes culture in general) as a communication process between the authors who create “messages” and audiences that “receive” them. In the name of progress our official culture is striving to force the new media to do the work of the old. We approach the new with the psychological conditioning and sensory responses of the old. The medium, or process, of our time—electric technology—is reshaping and restructuring patterns of social interdependence and every aspect of our personal life. It is forcing us to reconsider and reevaluate practically every thought, every action, and every institution formerly taken for granted. Electric technology fosters and encourages unification and involvement. Electric circuitry has overthrown the regime of “time” and “space” and pours upon us instantly and continuously the concerns of all other men. It has reconstituted dialogue on a global scale. The old civic, state, and national groupings have become unworkable. The public, in the sense of a great consensus of separate and distinct viewpoints, is finished. Today, the mass audience (the successor to the “public”) can be used as a creative, participating force. The shock of recognition! In an electric information environment, minority groups can no longer be contained—ignored. Too many people know too much about each other. Our new environment compels commitment and participation. We have become irrevocably involved with, and responsible for, each other. The environment as a processor of information is propaganda. Propaganda ends where dialogue begins. You must talk to the media, not to the programmer. To talk to the programmer is like complaining to a hot dog vendor at a ballpark about how badly your favorite team is playing. …now the reception point is just a temporary station on information’s path. If we compare information or media object with a train, then each receiver can be compared to a train station. Information arrives, gets remixed with other information, and then the new package travels to other destination where the process is repeated (Manovich, 2008). McLuhan used the term to describe a complex set of social changes in European society that resulted from the development of the printing press. Castells’s book title implicitly signals that he believes the Internet is as significant as Gutenberg’s movable-type printing press. “Networks are very old forms of human practice, but they have taken on a new life in our time by becoming information networks, powered by the Internet. 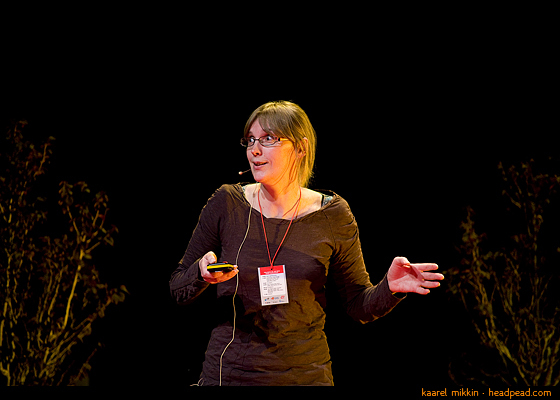 My TEDx Tallinn talk 25th of May, 2010 in KUMU. Deadline of applications: June 10, 2010. Expected start of the work January 1st, 2011. The employment period for the position is for 5 years and shall undergo re-elections after that. Tenure at Tallinn University can be achieved after two successful periods. The new position has been established with a significant financial contribution from European Social Fund. The Institute of Informatics has undertaken a major development by evolving international programmes and research groups in ICT. The significant part of ongoing research in the institute is focusing on social media ecosystems in the context of e-learning, e-governance, e-participation and network enterprise. Our international R&D team is using mainly participatory design research approach and intervention studies to envisage and develop prototypes of the next generation social media tools, with the special attention to their semantic interoperability, identity management, user experience design, activity pattern mining and semantic annotation for metadata. The successful applicant for a professorship is expected to make a significant contribution to the development of the Interactive Media and Knowledge Environments master curriculum as well as of the Information Society Technologies PhD curriculum. (S)he is also expected to supervise PhD and master students, to be a mentor for less experienced teachers of the institute, to develop new initiatives and to start a research programme related to the field of professorship. 5) An understanding of and commitment to the role of the University to the world innovation stage, experience in cooperating with the industry is particularly welcome.